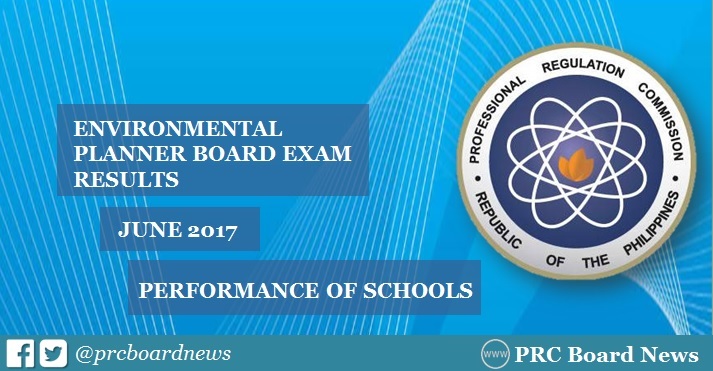 MANILA, Philippines - The Professional Regulation Commission (PRC) announces the full results of June 2017 Environmental Planner board exam which include the top performing schools and alphabetical list of performance of schools today, June 13 or in 2 working days after the exam. PRC said that 739 out of 1,739 passed the Environmental Planner Licensure examinations. PRC and the Board of Environmental Planning administered the licensure exam on June 7 and 8 in the cities of Manila, Baguio, Cagayan de Oro, Cebu, Davao, Iloilo, Legaspi, Lucena, Pagadian and Tacloban. NONE OF THE SCHOOLS QUALIFIED. In the same period last year, PRC has no announcement of top performing school. Meanwhile, none of the schools qualified for the list in the June 2015 exam. The same case happened in the 2011-2014 examinations.